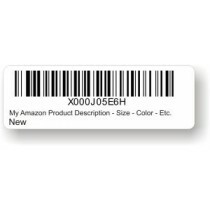 If you wish to use the Fulfillment by Amazon (FBA) service then you will need a FBA / FNSKU label for each product. We can print these labels for you on 50 x 35 mm adhesive labels. Simply order from us and supply the PDF you have created via seller central on amazon. We will simply print the labels and post them to you. Please ensure that on Amazon you choose the 40 up labels 52.5 mm x 29.7 mm on A4.